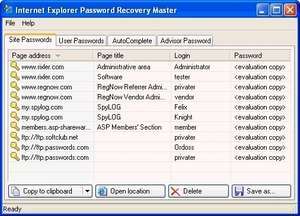 IE Password Revealer is a password recovery program used for keeping an eye on secret data stored on your computer (in Temporary Internet Files and other Temp directories) by Windows Internet Explorer (IE7, IE8, IE9). It can reveal passwords and usernames saved on forms and autocomplete. Password Revealer will also remove and restore/crack the Content Advisor Password when importing and exporting auto-complete information. Internet Explorer Password Revealer 2.0.0.1 is a shareware program and can be used as a demo to try the software until the free trial period has ended. A full version of the program is available after the trial period ends. For security reasons, you should also check out the Internet Explorer Password Revealer download at LO4D.com which includes virus and malware tests. Additional screenshots of this application download may be available, too. Internet Explorer Password Revealer has a presence on social networks.